"DESPICABLE ME" turns out to be surprisingly funny, charming, and even timely - given that its title character is an incompetent Eastern Bloc villain. The kind of guy who'd be right at home in that recently busted-up ring of KGB (KGB-minus?) agents who went deep undercover to infiltrate Yonkers and other New York suburbs, so they could relay to Moscow information on . . . Chuck E. Cheese? The Boris Badenov stand-in in "Despicable Me" is Gru (voice of Steve Carell), who, as the movie opens, is trying to steal the technology for a top-secret shrink gun, only to have it stolen from under his needle nose by a newer, younger rival. Gru, never much of a supervillain to begin with, is over the hill, and everyone knows it - he's having trouble obtaining venture capital from the Bank of Evil (the movie doesn't miss a chance to make a Wall Street joke), and so his scheme to shrink and steal the moon is now in jeopardy. His last chance: To adopt or otherwise shanghai three orphan girls and use them to infiltrate (as cookie sellers) the home of the man who has the shrink gun. It's an antic plot, but it gets the little-boy demographic to the action sequences without wasted motion. 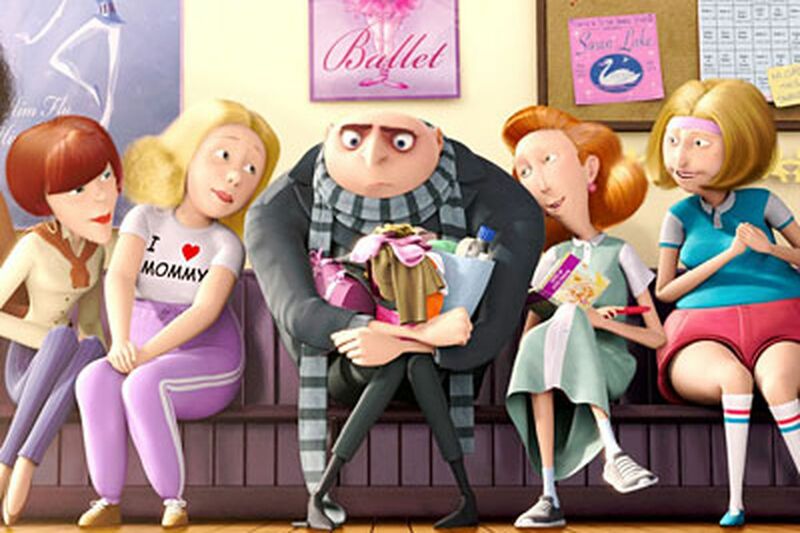 It also gets us quickly to the surprisingly generous emotional core of the movie - Gru is a lousy bad guy, but he turns out to be a pretty good father, and though he works hard to maintain a despicable exterior, his feelings for the adorable girls are ultimately impossible to disguise. As, I expect, will yours. Although you can take that prediction with a grain of salt. I am a notorious sucker for orphan stories, as "Nacho Libre" proved. You show me a fat luchador/monk who makes smiley-face salads for orphans, I'll show you at least a B+. Even by those lax standards, "Despicable Me" is a pleasant surprise. It starts slow, and while it seems to have borrowed most of its visual and storytelling ideas, it's also reinvigorated them. Directors Chris Renaud and Pierre Coffin get a lot of comic mileage out of Gru's little yellow "minions," a small army of chipmunk-voiced helpers who've dominated the movie's marketing, and helped create an idea of "Despicable Me" as a bouncy comedy. It is that, but the movie has a Pixar-ish emotional center, based on the bond between Gru and his "daughters," quickly but deftly sketched (one smart one, one tomboy, one naive baby). "Despicable Me" was made overseas, mostly by French animators and probably at a bargain price. It was produced by Chris Meledandri, the "Ice Age" creator who's functioned as a kind of CGI-animation third-stringer behind Pixar and DreamWorks. There's nothing cheap or third-string, though, about the execution and impact of "Despicable Me." And the movie paid top dollar for vocal talent - Jason Segel, Julie Andrews, Russell Brand, Kristen Wiig and others. It's a nice summer surprise.